Lancaster Family day choices has been a fun website to create. The general feel is meant to convey a sense of contemporary solemnity over a flair of whimsy. This is an event page promoting Foster Care through a family-centered fun day. The colors and layout are designed to blend the seriousness of the theme with the jocularity of the event. The front page is light and clean, featuring a hero image from last year’s event. The sponsors wanted the page to be an informative website about the event and the two main links are immediately available on the main hero image. Removing the necessity of deep clicking, the most important information is located on the front page, designed in an infinite-scroll style layout. The user simply scrolls into the next section, broken into small snippets for fast, easy viewing with links for further reading. 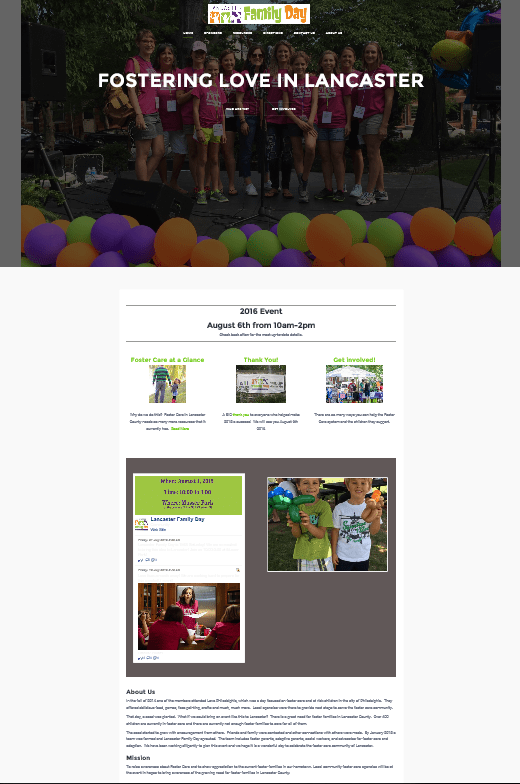 The sponsors also wanted to be able to connect social media to the website, so we imported their most recent Facebook posts into one of the front page sections as well as added a footer widget at the bottom, connecting users back to Facebook. They also wanted to retain control over the content, so the back end has been created to be easy-to-use for non-designers. The menu is a standard smooth scrolling menu that has been designed to “stick” to the top of the page, making the selections available, despite having scrolled to the bottom of the page. Additional pages include sponsor lists, directions, and event information.